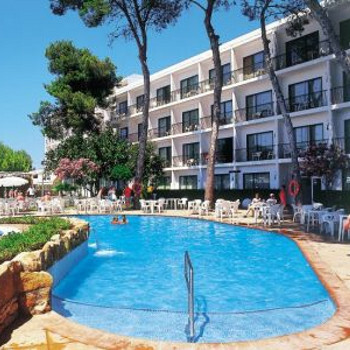 Catalonia Ses Estaques is an adults only hotel located on the Ibizan coast, just outside Santa Eulalia del Rio. The hotel benefits from being right on the beach and a few hundred meters from the resort centre. Enjoy a relaxing time by the pool, or at the cocktail bar while you enjoy the views over the marina. What can I say! During our stay, the hotel put up a list of guests who had visited previously. One couple were on their 40th visit, one on their 37th and another couple on their 33rd with loads of others in double figures. It was our 1st visit and the hotel does cater for the 50+ market (no children). 3* Hotel / 3* Facilities / 4* Location with 5* Staff. Food is good and the hotel is spotless. We will be returning again. This was our 3rd visit to this hotel and hopefully not the last. Everything about it is brilliant - staff, location and all round presentation. Yes it caters for the more mature British couples and that is one of its strengths. You are made to feel special and they can’t do enough for you. If only other hotels had the same ethos. This may be why some 42% of guests return at some point. If you want a truly Continental flavoured hotel this is not for you. As a returning guest iced champagne (or equivalent ) was delivered to our room on the second day. The evening entertainment comprises of the resident duo, the Thomson entertainments team and visiting cabaret. It may not suit everyone all the time but there is sufficient variety. During the day the entertainment team organise various activities which you may or may not wish to participate in. As for food there is a vast choice. People will find more than enough to their liking. The staff at the hotel has hardly changed during the span of years we have been going and the Manager (who is about to retire ) has been in charge since when the hotel opened in the late 60's. Location wise its ideal. A 10 minute promenade walk out of the centre and right on the edge of the Med. It only has a small man made beach from which you can swim, but the pool area and gardens more make up for this. The hotel is adjacent to a working marina which berths some 700+ class yachts. Some people may find the working area a disadvantage but this is only a minor issue. A nice touch was that on leaving the Hotel Manager saw us off personally with a warm hand shake. A nice touch. We flew from Norwich to the Ses Estaques hotel on July 11th our 39th Wedding Anniversary. We were welcomed with a bottle of Champangne on ice in our room with complimants from the manager. The location was second to none. Fantastic. We were in room 201. When we stood on our balcony we could see the stage which was like being in the Royal Box during the evening performances. We overlooked the well kept garden,the marina opposite, the swimming pool with water fall and also the sea with various boats to photograph whist passing. We could not wish for more The food was very good and no shortage. As all the people we met in the hotel were British you did somtimes forget you were in a foreign country. The staff were all very friendly and couldn't do enough for you. If you didn't have anything you wanted you only needed to ask. I mentioned it was difficult with one key as one of us may be out of the room and the other fall asleep so we cant't get back in. Straight away they said no problem and we were alocated another key straight away. This was a return visit and the hotel is still one of the most welcoming we have stayed in. The staff can't do enough to help you in the reception and the dinning room. Our room was spotless and was cleaned to a high standard as was all the hotel. There were plenty of sunbeds available all day on the sunbathing jetty by the sea. The pool area is relaxing as sunbeds are not allowed around the pool. The resort centre is about 5 minutes walk along the prom passing many bars and restaurants along the side of the marina. The Thomson hosts (Barbara and Susie)worked hard to keep everyone entertained all day with a variety of games and quizs. The evening shows were also of good standard especially the Thomson rep show. Many people go back here year after year and as it is not too big it retains a very friendly atmosphere. I would recommend this hotel for a restful holiday where you will make many new friends. Stayed here, yet again, the last full week in October, before the hotel closes for the winter. Just like two years ago, same week, everything was as good as before. Spotlessly clean, friendly,plenty of sunbeds...without having to put towels on them at all. Our room again was superior and on the conterary to what someone else said about the rooms being the same as the others, this is not the case. The superior rooms have the sun nearly all the time, whereas the tennis court side and front only has the sum part of the day. The rooms have better furnishings, curtains, bedding covers, table and chairs in the room and larger,better set out bathrooms. This is a fact, as I have seen both and had all confirmed by staff of the hotel. I can asure you, it does pay to have the better rooms. It is also quiet,overlooking the pool, marina, sea and town. There is no comparison. The pool, chairs and tables are washed every morning and dried by the lovely staff that later clean the rooms. The hot tubs are very warm. However, I have suggested to the very pleasant Hotel Manager that there is a definate need to heat the pool May, June and September and October as it is freezing cold.I am sure he will take notice and he listened to why this is needed. The food in both the hotel and the outside restaurant were very good. We couldn't fault any of the food or selection on offer. The gardens are kept beautiful and the staff have time for every guest and any requirement was met. We have been to three other Gold Hotels and this one twice. Ses Estaques The only disappointment was the pool not being heated, but thats nothing really.I am sure that will get sorted next time we go. Entertainment was good, although not the same staff as the previous time. This is the second gold holiday we have had this year and we prefer this hotel to the other one.Thank you to all the staff at Ses Estaques. We had an excellent 2 weeks at the Ses Estaques, it was our first time doing Thomson Gold and won't be our last. The food was very good, always plenty of it and enough to choose from. Our only complaint would be they did mostly british food, it would have been nice to have tried some local dishes. The hotel was always spotlessly clean and our room was cleaned daily. The location is perfect, very quite, opposite the boat yard so you can see the big boats have work done. It's in a fantastic setting, and a lovely walk into town along a promenade. The hotel staff are fantastic, they can't do enough for you, particularly Josaphina in the restaurant, manuel the head bar man and Isobel the head receptionist. The entertainment was good, some were better than others, one you must see is a very funny and clever guy called Fogwell Flax. Also Andy and Lucy, the Thomson Host and games organiser put on a good show. These two make a great team and also there is a local lady called Margaret who does organised walks for Thomsons and these are well worth doing as she has a lot of local knowledge. Yes we would visit here again. Sorry folks, found this hotel poor compared to other thomson golds. Dont waste money on upgrading room, all rooms the same, small+ basic, we paid for superior but nothing about it made it superior just got the tea making stuff + bathrobes. Food average, poor choice if you arrived towards the end of dining time( thats bad). No sunbeds allowed around the pool!!! sunlougers reserved with towels very early despite being against hotel policy. Minibar in room not allowed to be used as a fridge, anything removed even if stood unopened at side of fridge considered consumed and charged to room. POSITIVES: clean,good air conditioning+ hot tubs "hot"
wont be returning to this one. Just returned from our first visit to Ibiza and the hotel Ses Estaques. Everything about the hotel ticked all the right boxes - the staff worked hard to ensure that bedrooms and public rooms were all spotless, hotel is in an ideal position with only a short pleasant walk to the resort centre and the food was first class (albeit rather too "British"). The A La Carte restaurant also is worth a visit. Don't usually go back to the same place but if I were to return to Santa Eulalia I would have no hesitation in staying at Ses Estaques. When we first arrived we were a little apprehensive as we looked too young to be in the hotel (30s), but as the week progressed we saw other couples of a similar age to ourselves. I mentioned that it was our wedding anniversary the day after we checked in (which was the reason why we had booked this hotel - no children!) We received a complimentary bottle of champagne and a rose in our room. The hotel room itself was very clean (cleaned everyday), had an excellent view of the harbour and sea. The mini bar is very reasonably priced even if the soft drinks are in relatively small bottles - we used it all week and the final bill was a lot less than we expected. The staff were incredibly helpful and friendly. Especially Agustin, Adel, Alva and Manuel in the pool bar. The entertainment was a bit twee. Mainly singing acts and cabaret shows. There was one night when a comedian performed and he was so funny I was in stitches for most of the night. We never spoke to the reps (entertainment team), they tended to chat to the older guests, but we noticed that Andy in particular works some very long hours and always has a smile on his face. The only negatives are that there are no sunbeds by the hotel pool (just tables and chairs) and the sunbeds which are on the beach are reserved early in the morning, so if you don't get up in time to put your towel on one - it's a 15-20 minute walk to the huge sandy beach in Santa Eulalia so you can top up your tan! If I were to revisit Santa Eulalia (which is doubtful - as there is a big world out there waiting to be discovered) I would go back to the Catalonia Ses Estaques. This hotel was fabulous. Very clean. Entertainment great look out for Andy the Thomson rep fantastic singer wasted in his job should take up singing full time. Would go back some time, best part no children whatssoever.